The cross-country season ended last month but rose again on Easter Monday, with the Lewes 10k. I last ran this in 2015, which I recall as dry-ish, though even in the driest conditions the low-lying field at mile 4.5 or so is always boggy. Today it, and the ploughed field before it, were bottomless. The race starts and finishes on the civilised surface of the track at the Lewes Leisure Centre, then heads off on paths parallel to the A27. These paths contain puddles whose depth has never been fathomed, and by the time we took an underpass under the A27 and turned for open country, my feet were thoroughly soaked. The race then goes out along the Ouse valley, turning towards Iford village. These sections were muddy, and avoiding puddles would have been impossible, even if I could have been bothered to try. After this come the fields, first the ploughed one, an ascent and descent to a brief paved section, then the boggy field that takes us to the rugby club. Then the last mile and a half is on a firm, though potholed and puddly, surface. 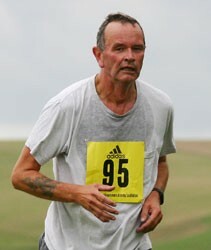 I felt reasonably proud of myself here, for I managed to keep a decent pace gong, and overtake some of my fellow runner. Then we burst back onto the track for a half-circuit and the finish. Everywhere there were echoes of the Moyleman, which I have yet to write about. I was given my number by Lewes AC people who had marshalled two weekends ago, and who greeted me warmly. They have promised to run it next year. And as we ran round, I could see portions of the course. Early on, another runner nearby pointed out Mount Caburn to his companion with pride, saying that’s the last hill I ran over in the Moyleman. Well done to Lewes AC for a great run, well marshalled in spite of the conditions. Everyone who finished was smiling. Photo credit: Danny Simpson.